The Jubilee was created to commemorate the Diamond Jubilee of Queen Victoria. 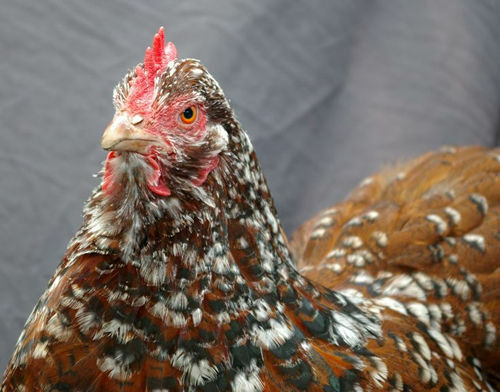 It is a bit of a mystery as to exactly what breeds were used to creat it, but it is believed to be a decendant of the speckled sussex, and some say the buff orpington. There is also a theory that it was wiped out in Germany during the war as Hitler wanted all British breeds culled, and with the Jubilee having such a patriotic tie with Britain, these were not spared, although having chatted to a German breeder, he told me that two differnt types of the colour variation, a darker mahogany ground colour which is the traditional kind, and a lighter more ‘ginger’ or buff ground colour known as the Diamond Jubilee, both re-created in Germany after the war. The feather pattern which makes the Jubilee, is a very complex colour, and maturing birds can take up to 18 months to be ‘finished’. Not a bird to keep if you’re impatient! The shaft should be a dark mahogany with a clear black band, finished with a white tip, or ‘pearl’ at the end. It should have no smuttiness, or leaking of the black into either the brown, or the white as this is classed as a fault. The old standard page goes into this with more detail. The colouration has a few names, according to the breed, millefleur as it’s called in pekins and barbu d’uccles and brown porceline in wyandottes, and the german bred orpingtons, but it’s all the same colour. 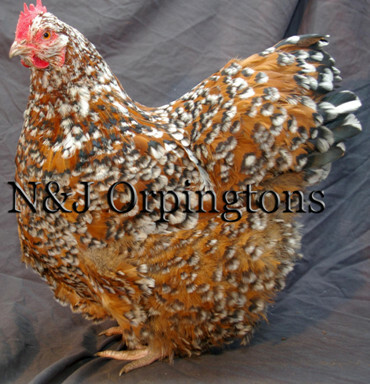 Our line of very fine examples are from Germany, and we have been successfully breeding with them now for four years, and many chicks later, they are still some of the best Jubilees in Britain. Understanding the colour, and the genetics needed to make the Jubilee patterning is worth while getting to know, keeping it is very important, as once lost, it is near on impossible to regain.